Lately, I've been indulging in chocolate in my morning. I make my superfood smoothie and take it to the garden, where I sit and enjoy all the richness that life has to offer. Superfoods enhance our health and quality of life by supporting the elasticity and longevity of our bodies. Chocolate in the morning? That can't be good can it!? 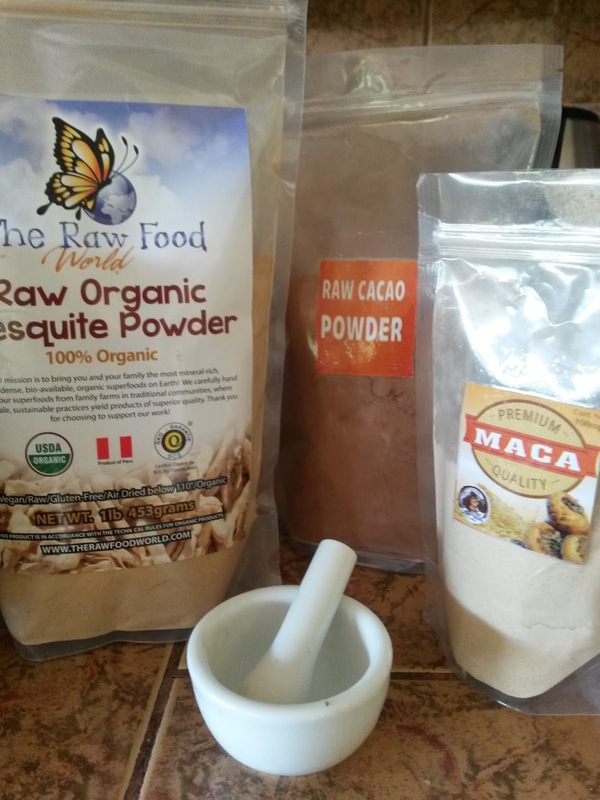 Raw cacao is actually a powerful medicine that you don't want to miss out on. It boosts energy and enhances mood by providing nutrient dense anti-oxidants, omegas, minerals and more! It is one of the worlds most chemically complex foods on earth! Check out this detailed article on the secrets of raw cacao that shares extensive information on the benefits of raw cacao and why it should be a staple in your diet! 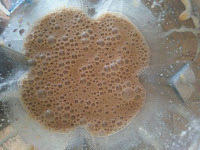 Along with Cacao I add mesquite to this smoothie. Mesquite is also a superfood. It is high in calcium, magnesium, iron and zinc. The dried pod is harvested from a tree thrives in a dry environment and ground up into this powder. It has a malty and sweet flavor. Sometimes I add Maca. Maca is a great source of protein and fiber as well as vitamin C, copper, iron and other essential vitamins. It has an earthy full flavor. I like to support myself on a raw vegan diet by eating things that bring me joy and are good for me! I feel so satisfied when a meal is interesting, tasty and healthy. It's important to be excited about what we want to nourish our bodies with. Make sure you buy your superfoods from a reputable source. It's always best to make sure your herbs and spices haven't been irradiated. Mountain rose herbs is a great company located out of Eugene, Oregon. I have been purchasing my superfoods from the raw food world and trust the products. It's wonderful to also be able to purchase from and support local family business's that harvest locally and process humanly while keeping it raw. 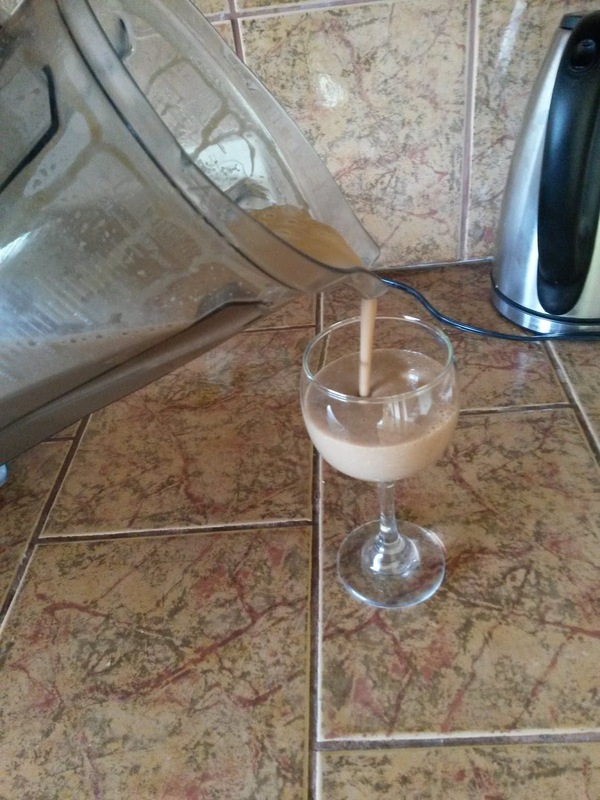 You will need a Vitamix or trusted blender. Start with chopping the bananas into chunks and add them to blender. Next add your powders. I like to vary my smoothie and sometimes add a little cinnamon or use Maca instead of Mesquite. Cut your avocado in half, pit it then scoop out the fatty fruit and add it to the blender. I then add filtered water until it covers everything. If you feel inspired add the coconut water from your young coconut! You could also add any vegan milk to make it creamier. Other superfoods options could really jazz your smoothie up. Try a handful of goji berries or dried blueberries, maybe even a handful of cacao beans or a few pieces of raw cacao paste! A half tsp of Spirlina or a few tbsp of a nut butter would be great too! Once you've added all your ingredients and put the lid on the blender and blend for 30 secs. Use the plunger if necessary, add more liquid if it appears to thick and blend again for half a minute. Viola! Delicious goodness for the body, heart and taste buds. This is the simple chocolate smoothie that has made me feel very full on just one meal a day. It makes a whole blender full which is about 4-6 cups worth. When I make the smoothie, I typically will have it for my omad or save half for the next morning. It can also be shared with family and friends. Thanks for taking part in this raw vegan recipe share. I hope you enjoy the smoothie and let me know what you think in the comments below! What other ingredients do you think would make it even better! ?